Medics describe vicious attack on MDA staff attempting to treat patient. An MDA staff member was physically assaulted Saturday night at a dispatch center near the Dead Sea. The incident occurred after a woman reported feeling unwell and requested medical assistance. A man in his early 40s escorted the woman to an MDA station in the Tamar regional district near the Dead Sea. While MDA staff members at the station asked the woman a set of questions regarding her condition, the man who had escorted her became agitated and yelled at the MDA representatives. When a female staff member requested that he calm down, the man assaulted her, beating and kicking her before throwing her to the ground. "I was in the next room and I heard a man yelling, so I ran over quickly – it was a terrible sight,” said MDA paramedic Yarden Madar. The staff member, Sarah Yisraeli, suffered injuries all over her body and was evacuated to Soroka Hospital in Beer Sheva. MDA officials say Yisraeli sustained two broken bones in her arm during the attack, bruises around her right knee, and has sharp pains in her lower back. Police took the assailant into custody Saturday night, and on Sunday brought him before a judge to have his arrest extended. 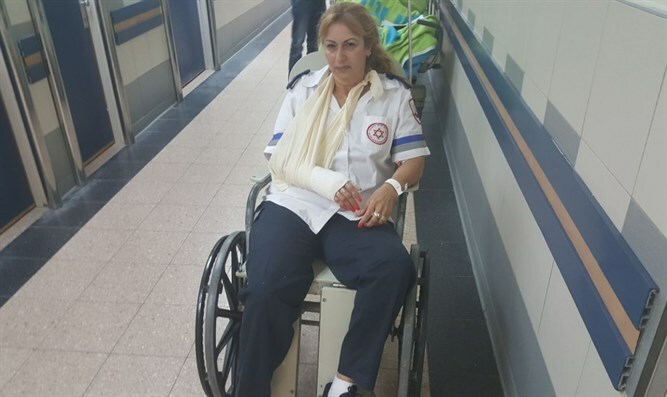 After she was evacuated to the hospital and treated, Yisrael described the attack. At that point, Yisraeli explained, the assailant became enraged.